Yesterday we celebrated our annual May Rosary pilgrimage. There weren't as many people as usual for the May pilgrimage and we think it's because they were all over at our Lady of Peace in New Providence for Msgr. Sean Cunneen's farewell Mass and reception. Our Brother, Fr. 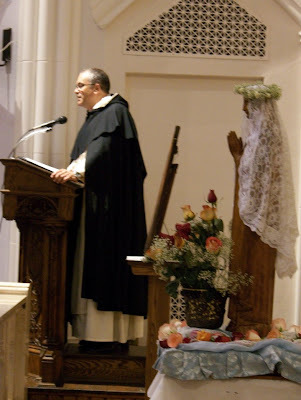 Vincent De Lucia was our guest preacher and he spoke to us about our Lady's motherhood using as his point of reflection a beautiful icon from Mt. Athos which is in the possession of the friars at St. Joseph's parish in NY. After, he brought it to the parlour for us to reverence and admire. Sr. Maria tried valiantly to convince Father that it would make a nice present for her 50th anniversary next year. No luck! We had a most enjoyable time with Father in the palour along with Sr. Anne, a Sparkhill Dominican and our good friends Charlie Martin and Michael McCarthy who drove Father Vincent to our monastery. Father Vincent was last here 17 years ago as a 1st year student brother. We enjoyed sharing photos of that visit. "When I had hair!" was Father's response! We hope that Father Vincent won't wait another 17 years before he comes again! Father, you are ALWAYS welcome!